The Philistines again prepared for battle against Israel. Samuel was dead, and Saul had expelled all the mediums from the land. However, when the Philistines gathered at Shunem and Saul gathered at Gilboa, Saul was afraid. He consulted a medium, which was against the Law. Saul disguised himself to do so and asked the medium to call up Samuel. Samuel chastizes Saul, telling him the Lord abandoned him because of his disobedience. The Israelites will lose the battle and Saul and his sons will lose their lives. The medium fed Saul and his men and they left. 3) Saul was afraid he’d lose (which the medium told him he would). He was afraid he’d die (which the medium told him he’d do). Saul was afraid of the unknown. He went to a medium to get his answers since God had abandoned him. David was afraid of fighting against his own people and of Achish discovering his heart. David either had to kill his people to keep up the farce or not kill his people and reveal who he actually was and where his heart was. 4) Part personal question. My answer: It was against God’s law to consult a medium. Leviticus tells us mediums defile us. 1 Chronicles tells us Saul died partly because he disobeyed God’s law and did consult a medium. I don’t participate in amoral behavior and the friends and colleagues I keep wouldn’t ask me to do so. Hence, I don’t put myself in those situations. 5) Personal Question. My answer: The bible, prayer, and the advice of other Godly people. And I turn to God because I know He will answer me in His time. I think once you sin, it’s easy to keep perpetuating that sin, which is what we see with Saul. He has disobeyed God so many times what does once more matter? He doesn’t think twice about it. We are influenced by the company we keep. You won’t be asked to sin if you have the right friends. David is living the lie he’s been telling for years now, and presumably will be force to attack his own people, the Israelites, now. Saul did obey the law by casting out spiritists and mediums (Leviticus 19:31, 20:6, 27 and in Deuteronomy 18:9-14). Shunem, in the Valley of Jezreel, was about twenty miles north of Aphek, the most northerly Philistine city. The fact that the Philistines had penetrated thus far gives an indication of their dominance over Saul’s kingdom, and of their intention to press further east to the Jordan. The Valley of Jezreel is the only part of Israel where you could go from west to east without crossing the mountains. The Philistines could now use their chariots in the flat terrain, and a victory here would cut Israel in half. God will not always answer everyone who seeks Him; not when a man is in a place of judgment as Saul is. King Saul has rejected and is currently rejecting God’s previously revealed will. Since Saul didn’t care to obey God in what he already knew, God will not give him more to know. Saul was hunting David when God didn’t want him to (1 Samuel 24:16-20 and 26:21). If we want God to guide us, we must follow what guidance we already have from Him. Who was the Witch of Endor? She was a medium or a necromancer – one who makes contact with the dead. The Hebrew word for medium is owb, and it has the idea of “mumbling” or speaking with a strange, hollow sound – as if one were “channeling,” with a dead person speaking through them. The Hebrew word has in mind the sound the channel makes as they speak. The English word medium has in mind the concept of a channel – they stand in-between the world of the living and the dead and communicate between the two worlds. Endor was only a short distance away, on the north of the Hill of Moreh, and accessible despite the Philistine forces close by. It was located four miles northeast of Shunem and thus dangerously close to where the Philistines were encamped. As Saul sought the medium he brought upon himself a curse. God said in Leviticus 20:6: And the person who turns after mediums and familiar spirits, to prostitute himself with them, I will set My face against that person and cut him off from his people. FUN FACT: Saul’s oath in the name of the LORD is comical. He is in complete darkness, yet still swears by the Lord, a reminder to us how meaningless this can be by those with the wrong hearts. This is the last time Saul uses the name of the LORD in the book of 1 Samuel. Why does Saul request Samuel? Saul knows Samuel is a prophet who can speak to God, so he’s hoping Samuel can speak to God for him. Why is the medium shocked to see Samuel? “I see a spirit coming up out of the ground.” The Hebrew word translated by “spirit” is the Hebrew word elohim – literally, “gods” but often applied to the One God in plural form. This plural form indicates the Trinity. When the medium said she saw an elohim, she did not mean that she saw the One True God or Samuel as a deity. Instead, to her Samuel was a god since he appeared out of nowhere as a spirit. Some scholars believe Samuel was a hallucination. But Saul saw Samuel as well. Some scholars believe the medium deceived Saul. Some scholars believe this was a demonic impersonation of Samuel. Some scholars believe this was a real appearance of Samuel. Most agree here since the evidence of the medium’s shock, the fact the Bible states it was Samuel who spoke, and Saul saw Samuel as well. Remember both Moses and Elijah also appeared after death when they appeared with Jesus at the Transfiguration (Matthew 17:3). Saul’s judgement was pronounced again. The medium learned a valuable lesson about dabbling in the occult. The medium was not responsible for Samuel’s appearance; God was. And for His purposes. When we close our ears to God, He will find unusual and perhaps uncomfortable ways to speak to us. No. Jesus explained in the story of the rich man and Lazarus (Luke 16:19-31) that before the finished work of Jesus on the cross, the believing dead went to a place of comfort and blessing known as Abraham’s bosom. When Jesus finished his work on the cross, sin’s penalty was paid for these believing dead, and they were then ushered into heaven. However, Samuel was in a real place. What answers is Saul seeking from Samuel? God doesn’t depart from man until man has departed from God. Hence, Samuel wants reassurance all will be well during the battle with the Philistines. Samuel is hoping in the 15 years that has passed since God took away Samuel’s crown and pronounced his fate (1 Samuel 15:28-29) that God would change his mind. God didn’t. God’s word to Saul didn’t change from the time He first said them until the time they would be fulfilled. Saul thought that time would change God’s mind; but time never changes God’s mind. Our repentance and genuine brokenness may. When the medium saw Samuel, she said he was wearing a robe, which would have identified him as both a prophet and a priest. In 1 Samuel 15:27, when Samuel announced that God would take the kingdom away from Saul, Saul grabbed Samuel’s robe in desperation. 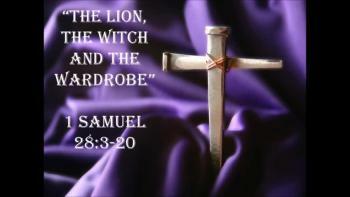 The Hebrew word used for robe in 1 Samuel 15:27 (meheel) is the same word used in 1 Samuel 28:14. It is likely that when Samuel appeared before the medium and Saul, he wore this same torn robe to remind Saul that the LORD has torn the kingdom out of your hand and given it to your neighbor, David. Samuel reminded Saul that he would die. Saul had plenty of time to repent; he didn’t. Neither do we. “You and your sons will be with me” does not mean that Saul was going to heaven and be with the believing dead. In the story Jesus told in Luke 16:19-31, the blessed dead and the cursed dead were both in the same general area. The believing dead were in the place of comfort knows as Abraham’s bosom, but the cursed were in a place of torment. The dinner Saul ate that night was akin to the last meal of a man on death row. God’s will would be done.